Please enjoy the following press releases from Urban Decay! I immediately bought the 15th Anniversary palette when it showed up on Sephora last week. Now up on Urbandecay.com!! Our super-exciting Fall collection is finally here. NEW Waterproof 24/7 Liquid Liners, an amazing cage-free eyelash curler, brow products, mascara and false lashes…and beautiful, bright lip color! The Super Saturated Lip Color is exclusive to Sephora, so you’ll only find those on Sephora.com…and unfortunately, the 15 year eyeshadow set has already sold out online at urbandecay.com (more coming soon!). Not to worry, it hits stores 8/1 so you can get it there! Bernie Madoff may not want to get a hold of these liquid assets, but be sure to keep a watchful eye on your girlfriends! Presenting the newest addition to our 24/7 franchise: 24/7 Waterproof Liquid Eyeliner by Urban Decay. Create runway-worthy eyes with the ease of a pro while leveraging your beauty portfolio via 11 knock-out shades (guaranteed not to budge…after all, they are 24/7). Hide yo’ kids, hide yo’ wife… you know the spiel. • Achieve clean, sharp, waterproof lines in an array of highly-pigmented colors that last 24/7. Each pigment rich eyeliner reflects light and dries down to a deep, glossy sheen. • Ranging from matte to glossy and even shimmery finishes, our 24/7 Waterproof Liquid Eyeliners provide unique and varied shades and finishes appealing to even those who shy away from liquid liners. Get the urge to get wet! • The new 24/7 Waterproof Liquid Eyeliner formula deposits vibrant color which glides on with such a finetipped brush that it’s virtually impossible to mess up. • The slim 24/7 Waterproof Liquid Eyeliner pen features an ultra-fine, easy-to-control brush tip made for newbies and pros alike to draw razor-thin lines, winged cat eyes, or thick, bold chromatic lines of color. • Packaged in a pen-like component reflecting the shade inside, each color is quickly identifiable from another (since you know you’re gonna have to own more than one, if not the whole set) when you’re in a packing frenzy. • For a precise liquid line, lean elbow on mirror – prevents shaking! Then, it’s all in the wrist! • Draw down into the lashes so that the upper side of the line is perfect and smooth. • Of course, the brush provided is 100% cruelty free, made from the finest synthetic materials. Despite her well-paid Latisse endorsements, you can outdo notorious man-stealer Claire Danes lash-for-lash with Urban Decay’s new nourishing, thickening, and lengthening Lush Lash Mascara. Infused with our Lush Lash Growth System, this mascara helps grow, condition, and beautify lashes without the harsh chemicals that probably blinded poor Claire from seeing her moral compass, causing her to take what’s not hers. • Indulge yourself with the mascara that does-it-all. Whether you’ve been cursed with brittle, fragile lashes, or just wanna give yours some more oomph, Lush Lash Mascara works double-time to beautify your lashes, thickening, lengthening AND building them all-at-once! • The unusual, creamy texture feels like you’re coating your lashes in a conditioning formula. It glides on like a dream and leaves lashes thick and LUSH! • Infused with the same growth serum (packed with Peptides and moisturizing Panthenol) contained in our Lush Lash System, Lush Lash Mascara actually promotes lash growth with daily use. • Though not ‘technically’ waterproof, this innovative formula stayed intact, showing NO signs of running, smudging, or flaking after being road-tested during a steamy yoga class. 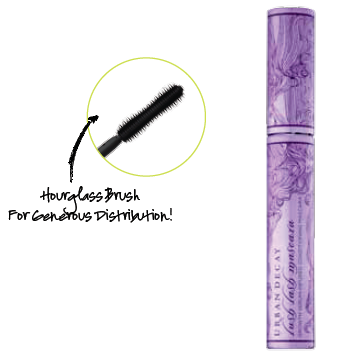 • The ultra-luxe iridescent purple tube features an innovative, large, hourglass-shaped brush ideal for applying even, yet generous coats of this rich formula. • Unlike many mascaras out there, Lush Lash Mascara enhances lashes over time rather than damaging them. • Pair Lush Lash Mascara with our Lush Lash System for super-fast, noticeable results. • For fast, easy, and gentle (we promise no stinging!) removal of our water-resistant Lush Lash Mascara, we recommend our Meltdown Makeup Remover. exhausted to go in to work (such a rough life, we know). The lip routine excuse isn’t gonna fly with your boss anymore. So, Urban Decay introduces Super-Saturated High Gloss Lip Color, the creamiest, most sumptuously pigmented, truly all-in-one chubby pencil to ever hit your lips. high-impact, long-lasting color of your favorite lipstick with the bonus of anti-feathering mega-watt shine in one chubby pencil! • Color is so saturated that your lips stay pigmented longer than with a lipstick or gloss. • Available in five dynamic shades, Super-Saturated High Gloss Lip Color offers bright fun colors paired with creamy or metallic sparkle finishes. True to their name, these high-gloss lip colors work doubletime moisturizing your lips while beautifying them at the same time! • Super-Saturated High Gloss Lip Color is softer than you could ever make a lipstick because the pencil supports the ultra-creamy formula. In a lipstick case, it would just go SQUISH! • Even the pencils with metallic sparkle feel like butter, leaving no trace of ‘sparkle grit’ on your lips. Super-Saturated High Gloss Lip Color (SRP $19) is available exclusively at Sephora and Sephora.com. 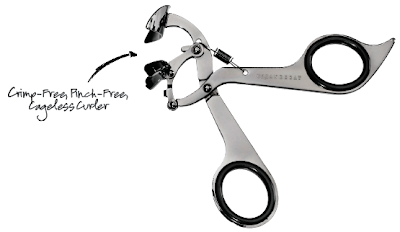 Zippers are to men what eyelash curlers are to women…necessary, but dreaded. Construed by many as a torture instrument, the eyelash curler inflicted unpredictable brutality in the form of skin pinching, lid pulling, and even eyelash removal at the root. And the curler of old wouldn’t even curl all your lashes at once, leaving the ends crimped rather than curled, an ironic twist given the sacrifice! It’s time for a revolution! Introducing The Revolution High Performance Lash Curler by Urban Decay, the cageless, pinch-free, crimp-free solution to creating beautifully curled lashes without living in fear. • Featuring a sleek, cageless design, The Revolution High Performance Lash Curler curls in sections for more targeted, precise results. Curl your entire row of lashes or just your outer lashes for a touch of flair; you have options! • We are proud to say The Revolution is an equal opportunity lash curler. Unlike most lash curlers with standardized cages, The Revolution provides a lasting, soft curl to those with any size and shape of eye and length of lash line. • The Revolution comes with five extra-cushy replacement pads (which should be changed every three months) guaranteeing a soft and natural, non-crimped curl every time. • A refined and architecturally pleasing beauty tool, The Revolution High Performance Lash Curler literally outshines all the rest with its glossy gunmetal finish and unique design. • For maximum spring strength, we recommend replacing The Revolution every 18 months. • After a battle with her lash curler ending with it hanging from her eye, Wende decided it was war! Being the determined woman that she is, it wasn’t long before the queen of beauty and function came up with the idea for a cageless, crimp-free, pinch-free, lash curler that is life-changing…The Revolution High Performance Lash Curler. • The Revolution High Performance Lash Curler is literally a revolutionary way to curl your lashes. For the best results, simply rest the curved section completely against your upper eyelid, making sure to squeeze gently for perfectly crimp-free, curled lashes. The Revolution is most effective when using your right hand to curl the lashes of your right eye and using your left hand to curl the lashes of your left eye. Change your outlook in the blink of an eye. The so-easy-even-an-eight-year-old-could-apply-them false lashes by Urban Decay welcomes the addition of four new wink-worthy styles to their Urban Lash False Lash wardrobe. Styles from coy to saucy boost confidence and allow you to add as much or as little drama to your lash life as you please. Handmade, cruelty-free, synthetic fibers make each pair affordably guiltless. So go and plan perverse things…no one has to know! 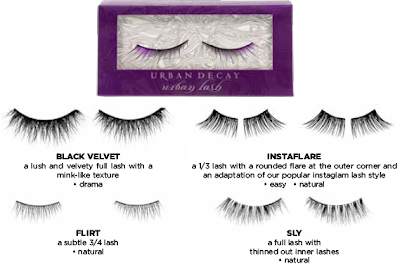 • Expand your lash wardrobe with the newest of our Urban Lash False Lashes! • Sly – a full lash featuring thinned out inner lashes and an almost invisible band for a more natural look. snafus and peace of mind. • Customize your falsies by trimming the width to your liking for a perfect fit! • To prevent lash-slide, wait just 10 seconds for the glue to get tacky before fitting your new glam lashes snugly in place. imposters with Urban Lash Mascara for False Lashes. end up with them lopsided anyway? Does it drive you bonkers that no matter how long you wait for regrowth, your brows continually have sparse spots? Do your brows have a mind of their own and just need to be tamed? Show your brows who’s boss once and for all! Frame your face like a pro with Urban Brow Precision Tip Brow Tint and Urban Brow Styling Brush and Setting Gel by Urban Decay. brow shaping. Color flows through the pen into the fine tip brush creating light, feathery, naturallooking strokes. beautifully on blondes, red heads, and those with light brown hair. The Brunette Brow Tint works wonders on those with medium to dark brown hair all the way to black. • With a won’t budge, water-resistant formula, Precision Tip Brow Tints do not smudge during a sweaty workout, when accidentally rubbed, or as a result of inclement weather. • If brows or sparse spots need more coverage, just layer strokes of Brow Tint to create a natural looking defined brow. gel provides all-day hold yet leaves brows feeling soft, never sticky, stiff or crunchy (no flaking either!). • Inspired by the ‘hairspray on a toothbrush trick,’ Urban Brow Styling Brush and Setting Gel is equipped with an innovative, mini, straight-edged brush…it looks like a toothbrush! • Much more effective for brow taming than a traditional spiral brush, our straight brush took two years to engineer and makes brows look amazing! 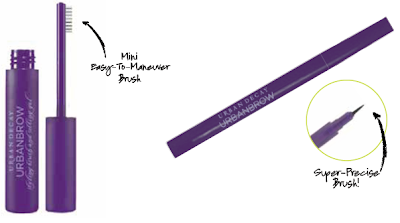 Urban Brow products are available at Sephora, ULTA, and select Macy’s. Or, online at Sephora.com, ulta.com, macys.com, beauty.com, and urbandecay.com. Rihanna may be the face of Covergirl, but we all know she sure as hell ain’t sporting those drab eyeshadows when being snapped by the paparazzi. Though her contract requires her to keep mum on the issue, ‘someone’ cleaned out her makeup artist who then had to call us to restock her kit with Urban Decay shadows. And with the introduction of our limited-edition 15-Year Anniversary Eyeshadow Collection filled with 15 all new shades, we’re staffing the phone lines to handle the calls for every celebrity makeup artist in town. Created for our beloved UD Junkies (like the singer who is BFF with Katy Perry) who are enamored with color as much as we are, the third of our limited-edition 15-Year Anniversary items, it comes in a bejeweled box so stinkin’ pretty it’s theft-worthy! • 15 mesmerizing shades for 15 years of UD! The perfect mix of neutrals and brights, darks and lights. 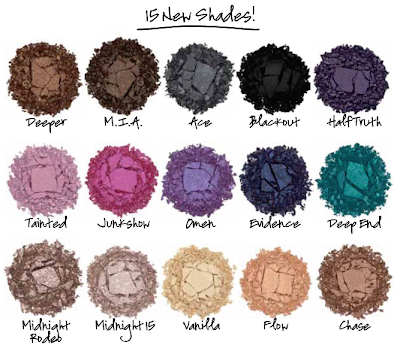 • Satisfying every possible eyeshadow need in one collection, these 15 hues feature our signature ‘low binder’ formula, pairing cashmere-soft textures with enormous pigment loads, resulting in mind-blowing blend-ability and knock-out color payoff. • Encased in a collectable shiny gunmetal box topped with a faceted purple “UD” jewel that highlights the laser-cut, filigreed edges, the 15-Year Anniversary Eyeshadow Collection is so gorgeous that we built it to live on! Simply, remove the shadow tray to reveal a purple, velvet-lined compartment ideal for stashing your favorite jewels and mementos. • The 15-Year Anniversary Eyeshadow Collection unveils 15 all-new, never-before-seen shades only available in this limited-release palette. • Get 24+ hours of wear with these new 15 shadow shades by using our Eyeshadow Primer Potions available in Original, Sin, Eden, and Greed.